1. Prepare Creamy Blue Cheese Dip: In small bowl, stir mayonnaise, blue cheese, sour cream and lemon juice until well combined. Cover and refrigerate until ready to serve. Makes about 1 cup. 2. Prepare Grilled Buffalo Chicken Wings: Prepare outdoor grill for direct grilling over medium heat. Remove wing tips from chicken wings, then cut each wing in half at joint. Thoroughly spray wings with cooking spray; sprinkle with salt and pepper. Place wings on hot grill rack; cook 25 to 30 minutes or until wings lose their pink color throughout and internal temperature reaches 165°F, turning every 5 minutes. If wings begin to burn, transfer to cooler part of grill. Transfer wings to large bowl. 3. Meanwhile, in medium saucepot, melt butter over medium heat. Stir in cayenne pepper sauce and honey; heat to simmering. Simmer 5 minutes or until slightly thickened. Makes about 2 cups. 4. Pour sauce over wings and toss until well coated with sauce. 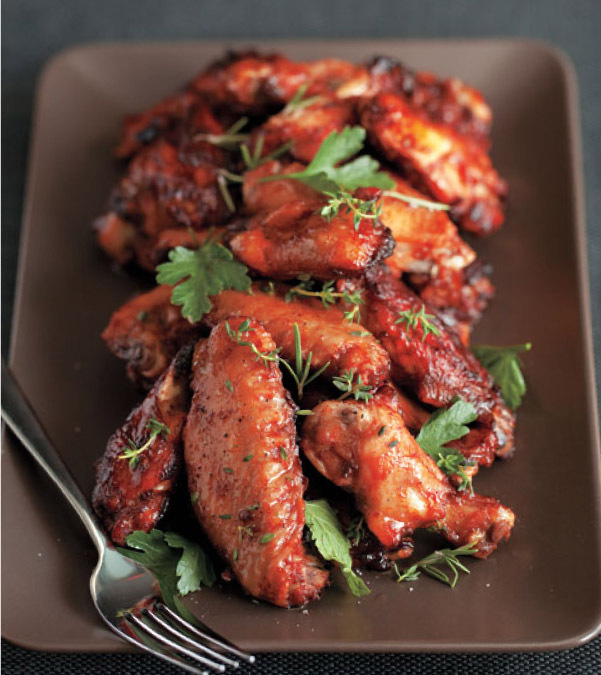 Serve wings with Creamy Blue Cheese Dip; garnish with fresh herbs, if desired. > Creamy Blue Cheese Dip can be prepared, covered and refrigerated up to 3 days. Buffalo sauce can be prepared, cooled, covered and refrigerated up to 3 days; reheat just before tossing with wings.